SUMMARY: It's small, for a big trial. Updates! : Got more info from Karey and my own research later the same day, in red like this, and lots of tweaks throughout that I didn't mark. Basically the article is the same, just some dates are adjusted. 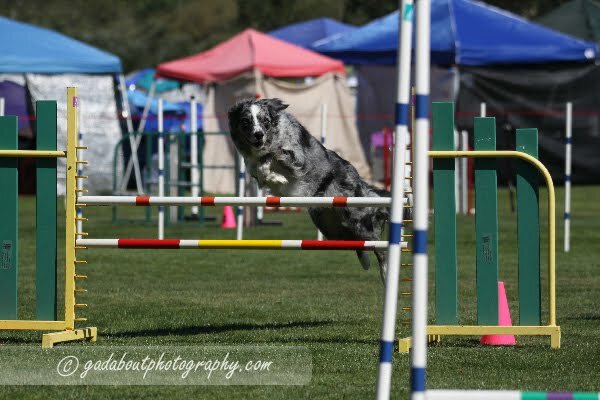 This weekend in Prunedale California, the Bay Team hosts its 8th annual USDAA Southwestern (Major) Regional dog agility trial. Before the Major Regionals existed, however, the Bay Team had been hosting Labor Day weekend trials since 1995. Their content, size, and location have varied over the years, and it's fun to sometimes look back and remember how things used to be. Note: Prior to 2003, the Regional qualifiers for each Tournament were held in different locations on different dates, and the Bay Team hosted one each year for a couple or three years. Herein, I'm talking about the Major Regionals started in 2003, in which all three Tournament events occur. From 1995 through 2002 (before Major Regionals), the various clubs in central California rotated the local tournament classes. 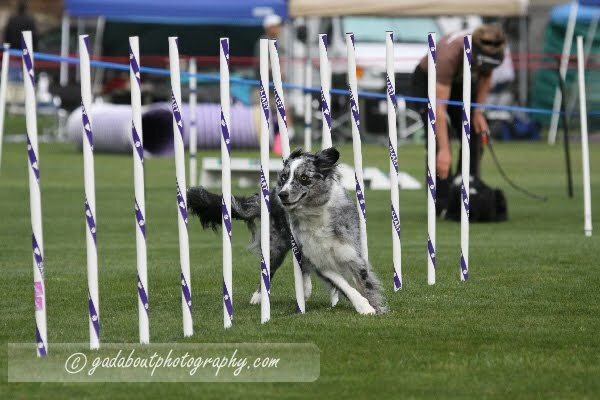 Each year, one club hosted a Grand Prix, one hosted a Steeplechase, and one hosted a Dog Agility Masters (DAM) Tournament. 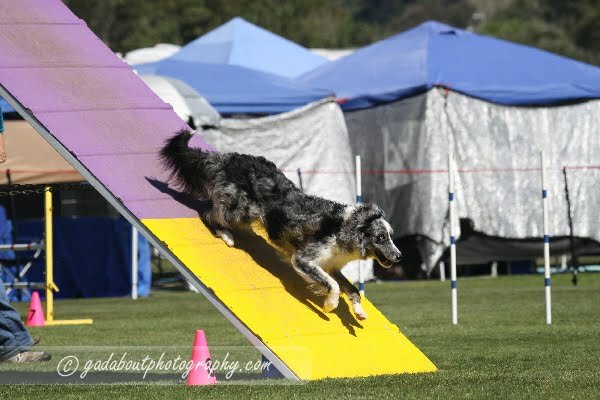 To our modern agility minds, that seems so odd; all these same clubs now offer both Grand Prix and Steeplechase at virtually every trial, and there are maybe half a dozen DAMs during the year as well. So, in 1996, 1998, and 2001, we offered a DAM at our Labor Day trial; in 1999, it was a Steeplechase; and in 2000, because of the Nationals the next weekend (see below), we offered no tournaments at all that weekend. Of course, qualifying for nationals has changed dramatically as well. 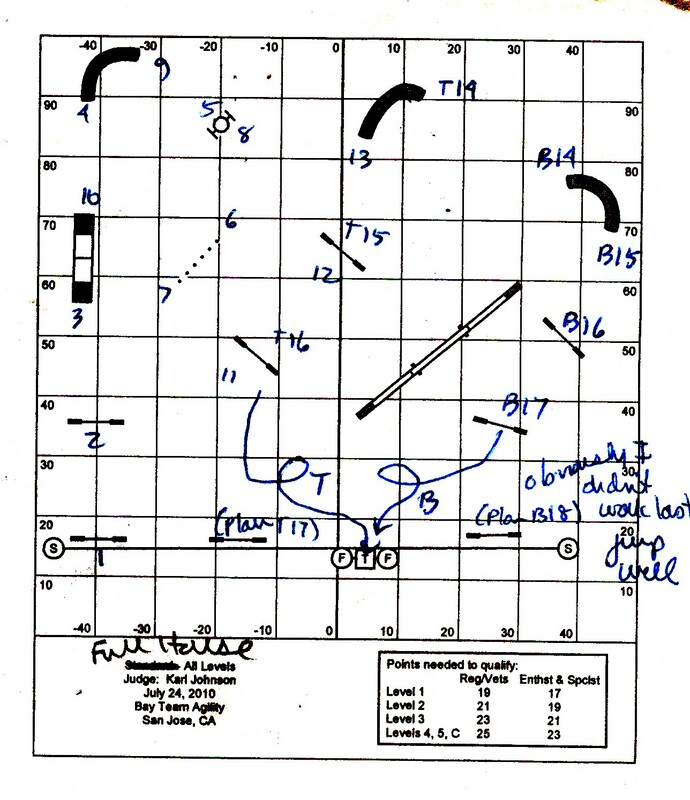 In 1996, for example, you could still qualify for Nationals in Grand Prix with a single Q, and you could get that single Q with as many as 10 faults. Then it changed to 7 faults, then 5 faults, then to two clean-run Qs. Therefore, people need more attempts to earn those requisite scores. That first Major Regional, in 2003, when we were required to host ALL THREE TOURNAMENTS IN ONE WEEKEND, OH MY GOSH!, raised quite a controversy. We'd never even hosted all three tournaments in a single YEAR before! It would be too much work, too complicated, people wouldn't want that much stress on the weekend, too hard to handle all the special awards... You get the picture. Who knew we'd be doing this for 8 years running, with no end in sight! Yep, we cheerfully run that complicated, stressful, impossible slate of classes every Labor Day without a whimper. Well--maybe one or two whimpers here and there; this isn't an easy trial, but the processes are pretty well understood and we have many enthusiastic and experienced members who see to all the details. Thanks Dog for that! In the heavily populated area where the majority of Bay Teamers live, vast swaths of grass or large arenas are hard to come by. In 1995 and 1996, the Labor Day trial used a small field in Daly City and shared a parking lot with the local library. The next year we moved to Cal State Hayward (CSUH, now Cal State East Bay) on the big lawn next to Meiklejohn Hall. Parking wasn't convenient and it was hard to get vehicles on and off the lawn for unloading. In our eternal quest for a better space, we managed to get the 1998 trial onto the Stanford campus. 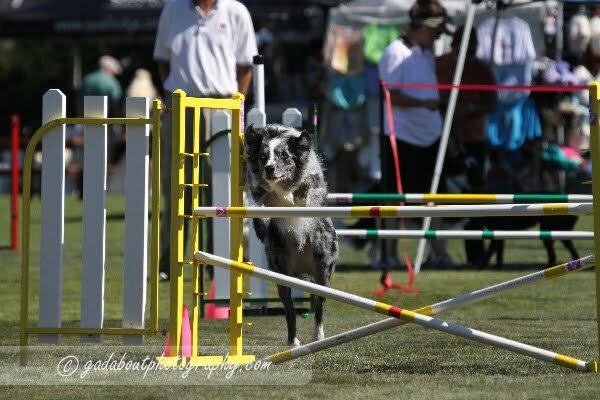 Stanford has miles of lush, green lawns crying out for dog agility. We had a great spot until a couple of days before the trial, when someone getting married on campus insisted that their wedding not have a view of dog agility, and we were unceremoniously and abruptly dumped to a tiny lawn between a busy street and some residence units. 6:00 a.m. weekend dogs didn't mix well with the sleepers. That was our only trial ever to be televised--what a mess! Although it was fun afterward to be on T.V. for 30 seconds (Jake and me after our DAM relay run), the huge delays in classes while the TV crew set things up the way they wanted made the days drag on much longer than expected; we couldn't use the loudspeakers while they were running the cameras (which was during most of the classes); and we had to wait at the ends of classes for them to interview folks coming off the field. The next two years, 1999 and 2000, we were back at Meiklejohn, but then the campus wanted to build there. We moved to the CSUH soccer practice field for 2001 and 2002. That had more space, but was inconveniently laid out and had challenging parking and access. We never held a major Retional there. Then we were able to negotiate to use the soccer fields at the Twin Creeks Softball complex in the heart of Silicon Valley, making it delightfully convenient for a large number of Bay Team members. The space was huge, but overnight parking was always iffy; the management team changed frequently and we got different stories at different times; their rules and restrictions were a bit of a thorn in our side at times; and when listening to their rates, we always heard ka-ching! ka-ching! Still, that's where we held our first major Regional, and we easily fit there for five years of Regionals, from 2003 to 2007. We might still have been there, except that in 2008, after confirming our trials for the year, management abruptly changed and confirmed that the long-rumored additional softball fields would be built on *our* soccer fields and that they were no longer available. Meanwhile, SMART had found Manzanita Park in Prunedale. The facilities are vast, nowhere near anyone's residence, and not too expensive. Our Labor Day trials have been there since 2008. Our first Labor Day trial, in 1995, had only two rings. 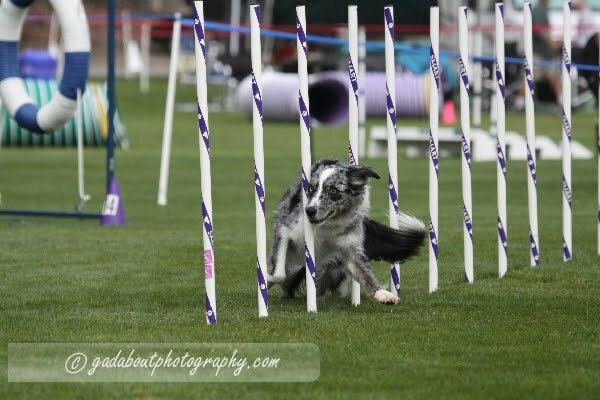 The following year, because USDAA didn't allow entry limits and entries had been growing in this still-new dog sport, we bumped it up to three rings. The arguments that ensued when three whole rings were proposed--oh, my! It was already hard to find workers, people were already encountering ring conflicts, it was already too stressful, it was too hard to manage. But the club did it, and it worked out just fine, and it wasn't long until all our trials ran 3 rings. In 2000, the USDAA Nationals moved to California, and we anticipated a huge draw to our trial because it was the weekend immediately preceding the Nationals. Rather than cancel it, we cut it back to two days (the only time we've done that for Labor Day). The next year, Nationals was later in the month, but our trial was so popular (in addition to being a Regional Steeplechase qualifier that year), that it was proposed that we bump ours up to four whole rings. The arguments that ensued--oh, my! It was already hard to find workers, people were already encountering ring conflicts, it was already too stressful, it was too hard to manage... Yeah, we know. So we did four rings, and it worked reasonably well (rotation groups introduced several years later really helped) and we continued to do four-ring trials until we moved to Manzanita Park in 2008--where we threw in, yes, a fifth ring on one of the 3 days, which has helped enormously with rotation groups. Sometimes it's hard to say why the numbers grow or fall they way they do. Of course the number of runs could vary with how many classes we offer, but we've been pretty consistent with that through our years of regionals. Our last pre-Regional Labor Day trial, in 2001 (the 2nd year of Nationals in southern California), we had 2961 runs. In 2002 and 2003, the Nationals moved to Texas. In 2004 through 2009, the Nationals were in Scottsdale, which Californians generally considered to be a "local" trial, so not surprisingly the Regional numbers jumped way up. The Bay Team Regionals were the last before the Nationals each year, so we expected, and generally got, huge entries. 1999 332 2399 3 - CSUH Meik. 1997 ~1000 3 - CSUH Meik. Not sure why the drop in 2008 and again in 2009; we offered the same number of classes, but Pairs moved to Friday evening, which might have been part of (but not nearly all) of the drop. My own thoughts are that (a) the economy played a part in what people could afford, and (b) people were self-selecting out of going to the Nationals and so weren't as concerned about picking up Regional runs. This year, the 2835 number is the lowest that we've had since our abbreviated trial in 2000! But it's not unexpected, now that Nationals have moved back towards the east. This should make for a relaxed weekend--at least compared to some of our most jam-packed prior Labor Day weekends--and I can use some relaxing at a trial! See you all there. The benadryl twice a day seems to have eased off Boost's scratching quite a bit, although not completely. At least we're sleeping through the night. Saw her littermate Bette abruptly sit and start scratching this weekend in much the same way. Bette's mom says hers started last year for the first time (Boost this year for the first time) and she uses prednisone spray to alleviate it and it works well--unless she forgets and leaves it at home over the weekend. She told me that Boost's littermate Derby has horrible flea allergies. SUMMARY: Well, this weekend wasn't a total loss. Boost is such a good worker's raffle participant: Won me another free day's entry at a future agility trial. Today ended with Round 2 of Steeplechase. I think this is only the second time that both dogs have qualified at the same trial, and last time I wasn't able to stay for Round 2. 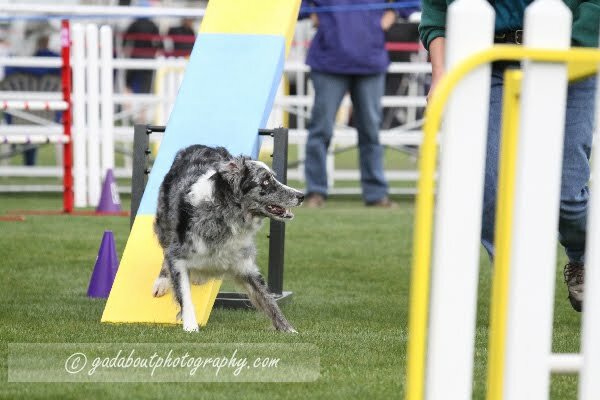 Tika had a truly gorgeous Tika Steeplechase run, fastest in her class. Unfortunately, she didn't even try to get a toenail into the A-frame's yellow zone. Fortunately, everyone else but one other dog also had faults on the course. We were 2 seconds faster than the winning dog but the 5-second (point) penalty kept us in 2nd place. Brought home $15. I was pretty happy with the run and I never turn away earned money. Who needs Qs or placements anyway? Tika Grand Prix: FLEW off the dogwalk. Boost Grand Prix: Refusal on a rear cross on a jump, and so when she didn't stop at the end of the dogwalk, I picked her up and carried her out. Tired of not having the contacts I trained. She did well on the first half of the course, including actually stopping on the Aframe contact. Tika Standard: Next to last jump, took it going in the wrong direction for off-course. The rest was lovely. Boost Standard: 2nd obstacle dogwalk, which she didn't stop at the end of, so I picked her up and took her off. Tika Jumpers: CRASHED the first jump, stunning me enough into stopping to see whether she was OK, and when she obviously was, I just shoved her over some random obstacle to keep her running, which was an off-course. The rest was lovely. Boost Jumpers: Two or maybe three runouts/refusals. Didn't ever go back to check the score. She's just looking at ME after almost every obstacle instead of looking for where to go next, and hence taking all those extra steps between jumps. Bah. Tika Snooker: I got greedy. Boost Snooker: Knocked a red when I yelled "BOOST" at the wrong moment and then I couldn't redirect her from the next obstacle. The first, um, 5 obstacles were nicely done. Hey, OK, it just occurs to me: I think that that one red in Snooker was the only bar that Boost knocked today. That's very good for her! SUMMARY: In which we discuss overmotivating and gradual deterioration of criteria. For an action that isn't purely mechanical or rote--that is, that requires even rudimentary conceptual, creative thinking--the larger the reward, the worse people do. I can give you an example. As in: Trying to get your 3rd Super-Q in Snooker to complete your championship (after you've already managed to get 2 but now cannot get the 3rd). Take me and Tika. Every time I went to the start line, I wanted that third Super-Q so badly that my brain starting blowing its fuses. The reward was SO high (in my own mind) because I wanted it SO badly, and as a result, I couldn't function. When eventually we got that 3rd one, we then got something like 3 in a row. I can't even begin to tell you the amazingly stupid things that I did during those attempts at that 3rd Super-Q. So, now, as you know, I discovered that Tika is in serious contention for Top Ten awards (Top Ten in the U.S. in USDAA). And not in just one class--in ALL FOUR classes (ignoring tournaments). And with one exception of Jake somehow stumbling into Top Ten in one Performance class one year, I've never been anywhere near this before--and am certainly nowhere near this with Boost--and Tika is 9 and a half with unpredictable bouts of soreness. If we don't get Top Ten in as many classes as possible this year, I may never again have a chance to be in Top Ten. Need I say more about how valuable I feel those Top Ten point rewards are? And the resulting disasters? OK, I will say more: First part of the year, before I realized we were in serious contention, we did great. Now? Wanting Top Ten points so badly? It is to laugh! I laugh! Ha ha! Pairs Relay? Don't care, doesn't count for anything. She and her partner took 1st. Steeplechase? Don't care that much. Good run and 2nd place. Standard: I misjudged what she'd do after the Aframe and had to call her off the wrong obstacle, for time wasted. And she decided not to go down immediately on the table. We ended in 3rd place for a mere 1 Top Ten pt, one second out of 2nd (3 pts), two seconds out of 1st (5 pts). Gamblers: High opening points. The gamble was hard--only 3 out of something like 80 Championship dogs got it. But in Tika's class--2 out of 6 dogs got it! And I really really wanted the 1st or 2nd. We had high opening points and my brain shut down before the gamble so I did something different from what I had walked. Result, no gamble, and 3rd place for 1 point again. Snooker: My legs ceased to function. I couldn't get around the course. She knocked a bar that I couldn't get to in the opening and I let her go wide on several turns because I wasn't there, and we ran out of time one second before completing the #7 in the closing. Felt like brain freeze. 4th place, not even 1 Top Ten pt. Steeplechase? Don't care, she's actually got several of them. Not perfect, but pretty nice, and a Q, which I believe completes her Tournament Bronze title. Pairs Relay? Don't care. She has way more of these Qs than anything else. Ran beautifully, still took 6th out of 26 teams despite her partner's refusal at the weave poles, which cost several seconds of time and a 5-second (point) penalty, and the partner's mysterious tunnel malingering (see vid below). REALLY REALLY WANT A SNOOKER SUPER-Q because we've never gotten even ONE and this one should be SO DOABLE FOR US. Meltdown. Not even a Q.
Gamblers: She had a decent opening but I didn't handle the closing as I had walked it. Much like Tika's run. Standard: Would like more of these, but not desperate. Not a perfect run--knocked one bar and came off the table early--but no refusals or runouts, like a miracle! ... is left as an exercise for the student. Boost had lovely 2 on/2 off contacts that I vowed would always be lovely. But sometimes I let them go, like in Steeplechase or Gamblers. So--yes, kiddies, if you don't maintain criteria, the dog *IS* smart enough to realize that! So at the last trial (CPE) she was leaving most of her contacts without waiting for a release, despite me making her "down" after most--erm, yes, most, not all--of the errors. And today? Didn't stick a single. Dang. Contact. Not one. As a result, if I'm behind her, she spins around in front of me and is now facing me. Makes it hard to do agility. Boost's Pairs Relay run was exhilarating! Imagine driving a race car full out on a challenging course and not crapping out. That's the high when Boost and I are communicating and she's running well. (Although in reviewing the run's video, I'm seeing an extra step in a couple of places where she shouldn't need one. Always something. Plus I look like I'm lumbering, not sprinting lightly like my pairs partner.) Watch for the mysterious tunnel delay when Killy runs. P.S. Those contacts are rubberized, in case you wondered what they look like. SUMMARY: My faithful Dog Training Notebook, with fun recollections and tips from the experts. At last Tuesday's session, I pulled out my old Dog Training Notebook that I always carry in my Dog Extras bag in my car--it's ALWAYS there. You can see how the top third is faded from where it sticks out of the bag's pocket. Notes from my January 22, 1996 second-ever private competitive obedience class with Remington. Back when I was still trying to fulfill my childhood dream of having an obedience champion dog. 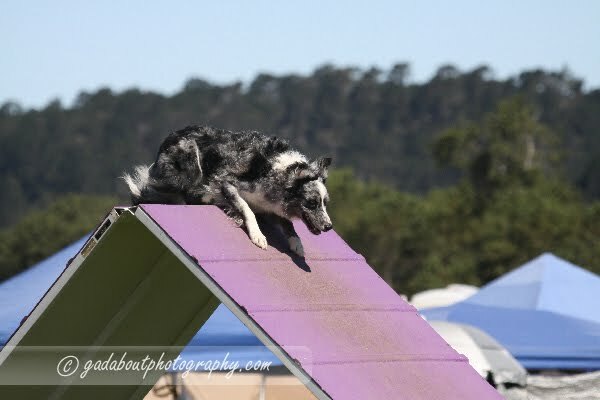 The following weekend, we did our first agility trial, the NADAC mudfest in San Martin. Heh. Novice A Gamblers - he was all over the place but paid just enough attention to qualify: 21 points (min 20) and 20-point gamble [which was a jump to a tunnel to a table]. He was wired, shaking, uncontrolled on leash until after run. Novice A Titling. Almost perfect 'til ran PAST final jump, therefore past finish line, for our only (and nonqualifying) fault. [Is it because I] relaxed and took it for granted? Not sure. He was exhausted after 1st day--slept in car on way home, went straight to bed at home. 2nd day more normal. After ugly #3 run 2nd day, before #4 I did some tricks with goodies and without (had been NO goodies most of weekend); practiced some close/attention obedience things; practiced some plain walking on leash to be sure he was paying attention. Maybe that helped. Have to think more about handling turns. Need to work on his attention; despite yelling COME on #2 two or three times, he still went ahead. Plus the 2 out of control runs. Maybe need "NO" in my vocabulary--might have stopped him from going on wrong obstacles? Remember to be upbeat and give goodies at end of runs. Use stopwatch to time/plan gambles. My notes on my January 29th obedience session say, "Skipped 3 days [of practice] because of NADAC." Heh heh. Continuing notes on obedience through July. "[Jumping 30", we're ] competing against the likes of Nancy Gyes with Scud and Winston, Jim Basic and Mick, Stuart Mah and Recce, Bill Newcomb and Flash, other experienced handlers like Ralph Frazier, Sharon Freilich, Rob Michalski, Candy Gaiser..."
A couple more notes in the fall of 1996 on obedience lessons. 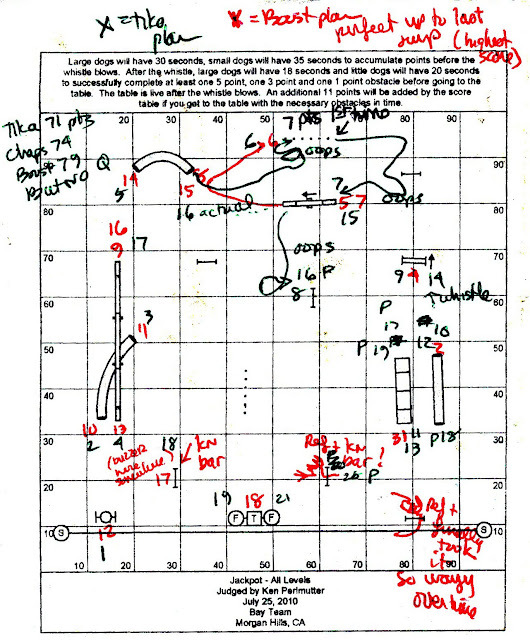 "At the top level [of competition], focus changes from dog/equipment to getting around the course efficiently. Historically, for a quite a while the Nationals winners were slow and steady because they could do the obstacles. Then it was the fast dogs [who won]. Now it's the HANDLER who wins." "Do all these exercises over and over until you're pissed off at them, and then do them some more, because you don't want you or your dog to be *thinking* about these on course." He trains only 10 minutes a day per dog, every day. Next up, Clicker Training with Mo Strenfel, November 2002. Suddenly I'm back in regular classes, with Rachel Sanders, August-November 2003. And another Jim Basic Gambler's Seminar, November 2, 2003. And finally: August 18, 2010: Nany Gyes on Boost jumps, refusals, and tables. 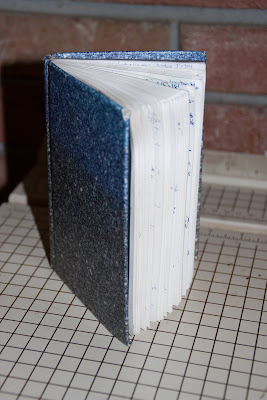 And that's it for the little book for now! Only 12 blank pages left. What will those pages hold in the future? Who knew it would last me 14 years!? SUMMARY: Every August 26. Adopt from a shelter! And other good dog things. I was so inspired after our session with Nancy last Tuesday. 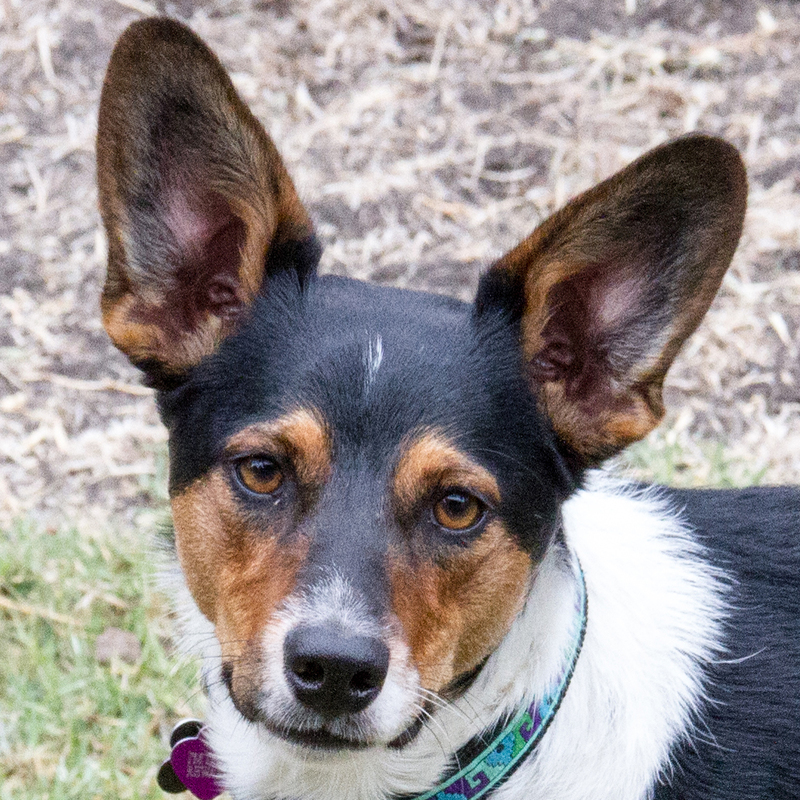 I came home intending to practice 20 dogwalks a day with Tika--fast with a nose touch--and 10 tables a day with boost with various temptations, and 10 go ons, 10 rear crosses, and 10 straights a day with boost. Came up with a great way of keeping track of my reps: I put out some old plastic microwave-dinner dishes under each end of the dogwalk, under the table, and near the ends of the jumping sequences. Filled my pocket with fingertip-sized pebbles (not the pocket with the clicker, not the pocket with the tasty reward treats), then dropped a pebble into the dish with each rep. So much easier than counting (I lose track) or trying to write it down (always running back to the notepad & pencil). I did good on Wednesday. Maybe half that on Thursday. Too busy with other non-work things on Friday so no time for training. 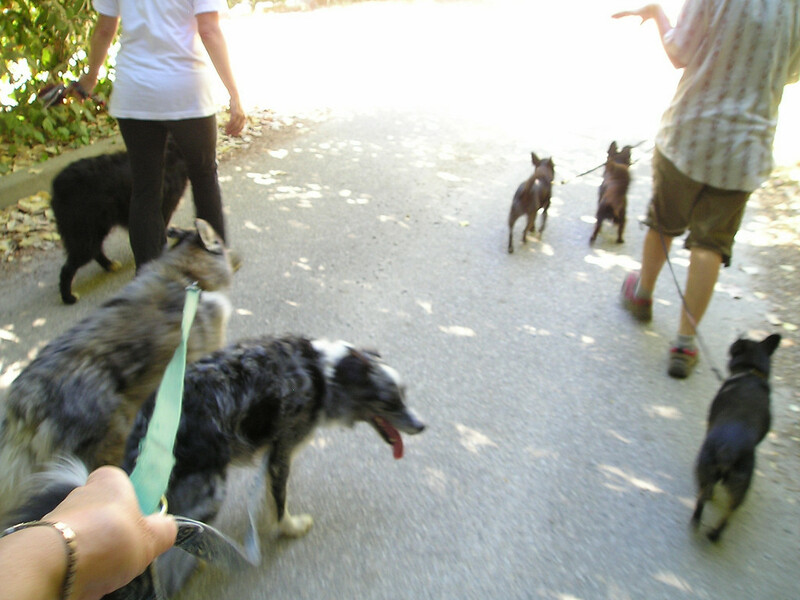 Busy all day Saturday, hardly even saw the dogs. Went up to Bonny Doon Sunday with the dogs so it was chores in the morning. Then this week, trying desperately to keep up my billable hours to pay for all this dog agility, on top of neglected chores, class on Tuesday, really brisk 6-mile/500-foot gain hike Wednesday evening (thank goodness the temps dropped a bit in the evening), and now it's Thursday. 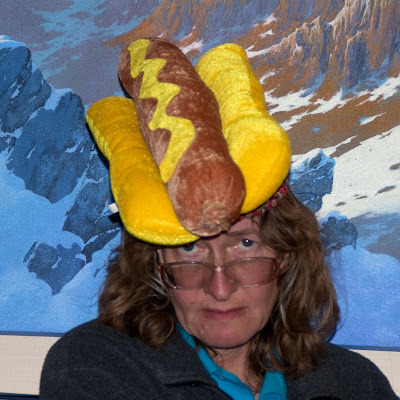 Tomorrow must pack and prep for the SMART USDAA trial in Prunedale. So it's SMART, then Bay Team, then VAST, those 3 weekends of USDAA in a row. Gah! I'm not worthy! ...I mean, not ready! So--I have my notes, I have my dogs, I have my counting strategy--but, argh, no time, must work, must blog, must pack-- and it'll be another weekend without The Appropriate Practice Time. 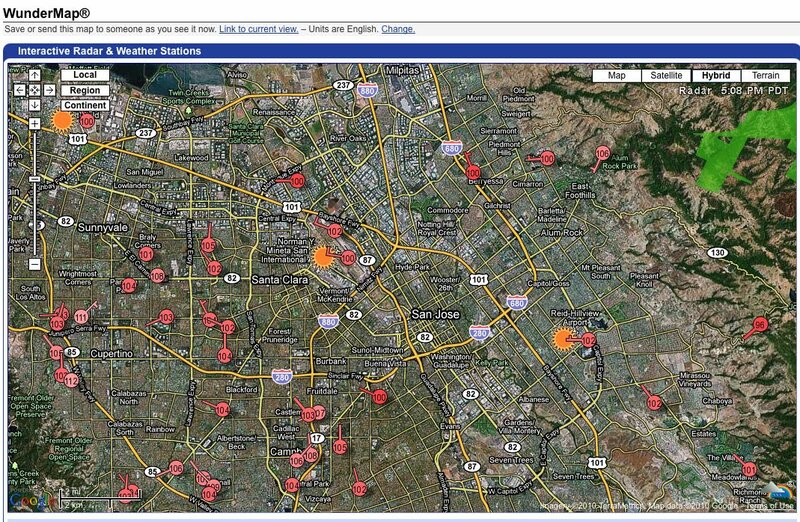 SUMMARY: Tuesday's record heat in the Bay area. SET INITIALLY ON AUGUST 1, 1993 AT BOTH SITES. SUMMARY: Here's our heat spell; hope it's gone soon. Plus new contact surfaces. The heat that has chewed on the eastern half of the country for so many months has spit them out and come looking for new prey--and here we are. 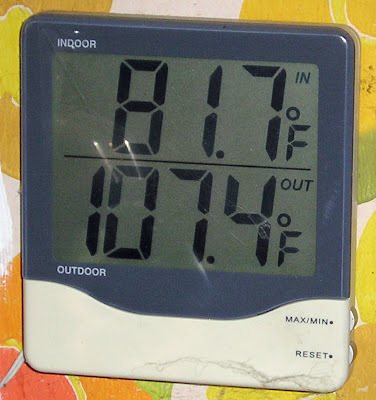 We in California may have been commenting on the unseasonably cool temperatures all summer--great for hiking and dog activities--but now we are obsessed with our mini-heat wave (yesterday and today, predicted to be gone by tomorrow, thank dogs!). We were scheduled for class last night at 7:30 in the east foothills. This is what Santa Clara Valley temps looked like at 5:00 on Weather Underground. Note there's only one temp reading in the whole area below 100, and that's 96 up in the hills. See that 106 in the upper right? That's in the vicinity of class. High-temp records for this date dropped left and right. We also had a Spare The Air Day yesterday. I felt it in my throat and chest. Wasn't going to go to class even if they held it--but they DID hold it, and I couldn't resist the call "Come try our new rubberized dogwalk!" We had the rubberized tables and chutes at the July trials. Nice! The dogwalk is pretty amazing--so quiet when the dogs run across it. And the color in the rubber is so good that, from a distance, you can't differentiate it from a regular dogwalk. The one last night still has "slats" going up and down--in this case, they're part of the rubber skin. 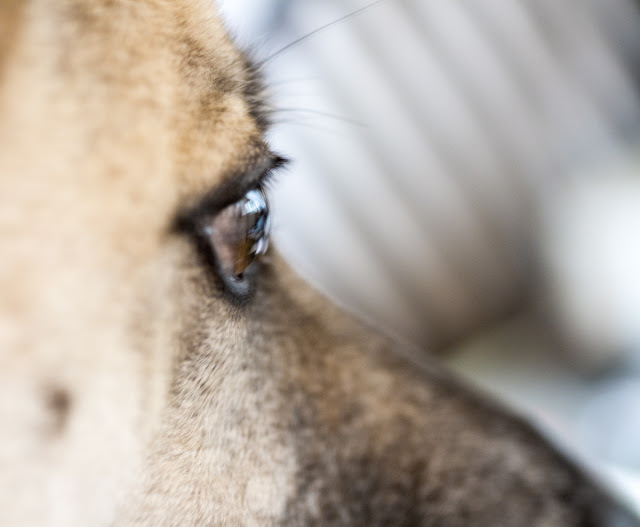 Dogs should be able to go much faster, more securely, over these contacts. Our main concern: What happens to dogs who get used to the better grip (particularly on the dogwalk) and then suddenly encounter an unrubberized one; will they be LESS safe trying to get on it and run across it? For sure, though, it puts an end to those exciting sliding contact finishes. Drat. OK, though, I'm sold; I may have sneered at rubberized surfaces originally, but now I'm convinced they're good. Didn't think to take a photo, but I'll try to remember this weekend. And it should be a good weekend--now they're saying that temps will drop into the 70s (low 20s C) or even lower in Prunedale. What a weird week! Wellllll... so it happened: 4 Dog Craziness tagged Taj MuttHall. I suppose, as a dog blogger, it's a given that I like to talk about myself and my dogs. Oh YEAH! So maybe no surprise: In January 2009 I posted 25 Things About Me, and 25 More (25 dog-related, 25 not). So I'm done! Go read that, if you must! Molasses Ain't Got NOTHN' On Us! 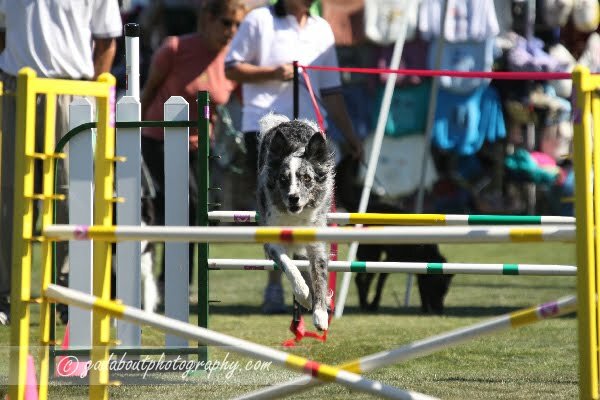 The Non-Dog Blog This is an agility/herding person who separates her detailed dog training blog from her non-dog blog (duh). You can start here or go directly to her Corgi Training Diary. Feed Polly Added Aug 25: oops, missed this one. SUMMARY: Photos from July USDAA. A teenage photographer (Gadabout Photography) came to the SMART USDAA back in July and took a ton of photos. Didn't find any of Tika, but here are some of the many Boost photos. Boost keeps a low profile going over the Aframe. She's pretty fast, flying close to the surface. But descending from a jump, those floppy little ears fly straight up! That'll be the only time you'll see her with pointy ears. This could be part of our bar-knocking problem, although I haven't asked any experts for analysis--she's leading with her left foot but also looking left, meaning she'll land on the wrong lead and/or try to change directions in midair, possibly knocking a bar. I wonder whether some dogs always tuck the same foot under when jumping and it's OK, or whether this is a symptom or cause of some of her bar knocking? Here's another one--she's clearly jumping to the right and leading with the left paw (which would be correct if going to the right), but looking left, so I miscued or she misunderstood--too bad I never see any photos of her with the bar coming down! Maybe the photographers just never put those photos up?! Oops, but wait-- what's wrong with this picture? Boost seems to get a thrill out of doing the teeter--and of course of taking off running again afterwards. Dang ear flipped backwards on top of her head again! Makes me crazy! SUMMARY: Went on a hike with my dad, no Merle Girls. Late this afternoon, we hiked up into Fremont Older Open Space Preserve. About 2.6 miles round trip, maybe 350 feet cumulative elevation gain. I couldn't remember what the trails were like, so didn't take the dogs. Probably just as well; many other hikers had their dogs along, and Tika would've gone nuts. But many of the trails are along wide firebreak roads, so it could work out OK. Got to pet and play with a chocolate labrador puppy, my guess 3-4 months old; got sniffed by a couple of whippets; saw a German Shorthaired Pointer cruising along (illegally off leash) with his human; and several small dogs of various breeds. For all dozen photos from the hike (no dogs, sorry), visit my photo page. SUMMARY: Personal training part 1: Working on Boost's table down--also bar knocking, refusals, and go ahead. Table down: The table is one of the obstacles in the Standard (sequentially numbered obstacles) class. The dog must lie down on the table, wait while the judge counts 5 seconds, and not leave until after the judge tells the handler "Go." 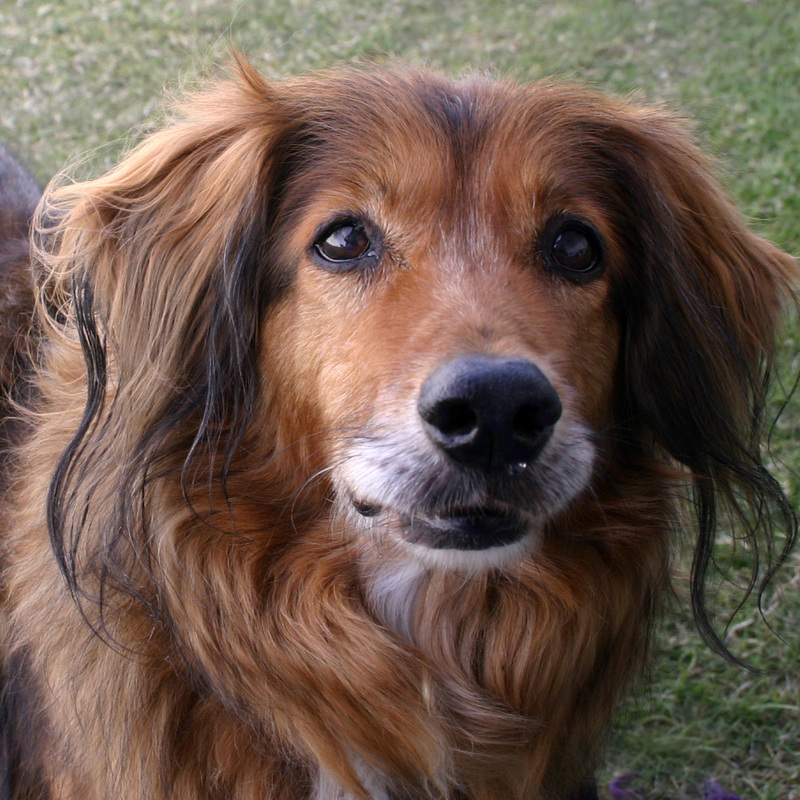 [Handlers also usually have the rule that their dog must not leave until the handler releases the dog; I used "break!" for Boost.] 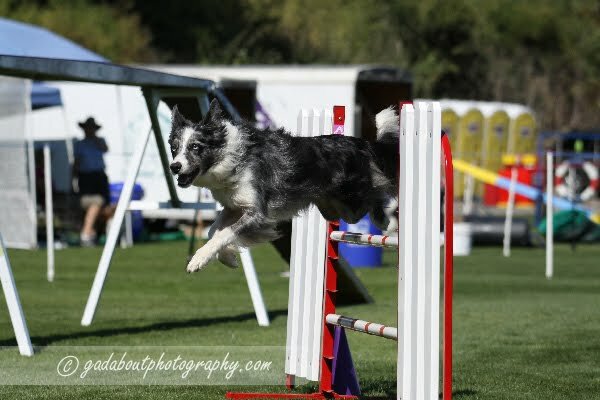 The problem: The judge's count stops if the dog isn't completely down, for example, let's say a certain BORDER COLLIE whose name we won't mention lifts one elbow (or more) half an inch (or more) off the table in excited anticipation. 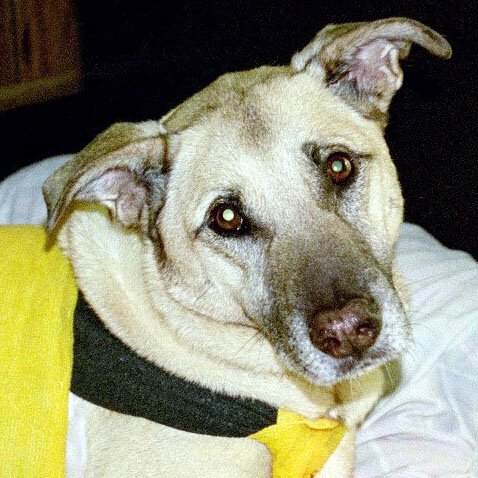 Refusal: On any obstacle, if the dog has started its approach towards the correct obstacle and then ceases that approach (hesitates definitively, turns away and turns back, like that), that's a "refusal" and it's faulted. In most classes, faults will prevent you from earning a Q (qualifying score). 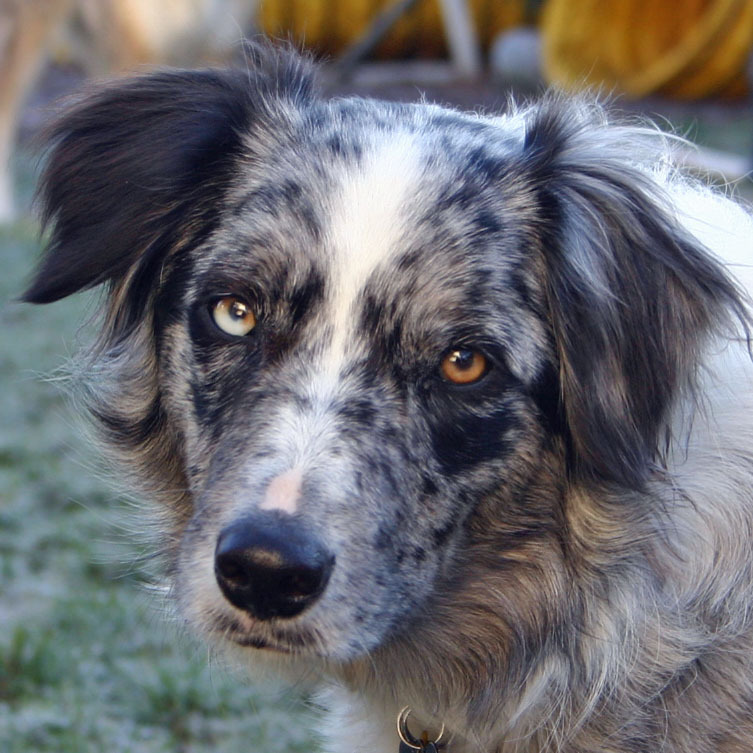 For example, let's say a certain BORDER COLLIE w.n.w.w.m. turns back and says "This jump?" Runout: If the dog goes *past* the intended obstacle, that's a "runout" and it is also faulted. 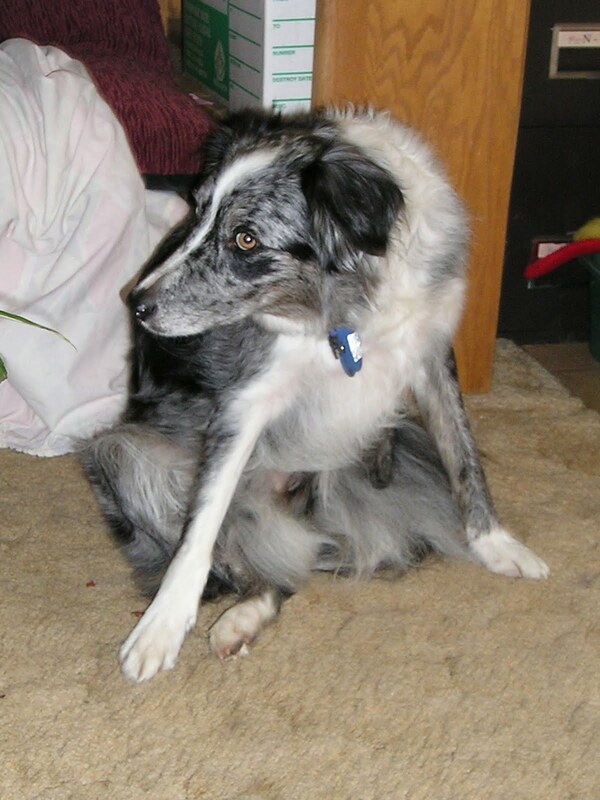 For example, pick some random BORDER COLLIE FROM MY HOUSEHOLD and you may well see her looking at me and continuing to run without checking to see whether there is an obstacle right dagnabbed in front of her that might require going over. Jump bars: You already know that knocking a jump bar is also a fault, I'm sure. And that certain BCs in this general vicinity have a problem with that. Proofing: This is not just in agility: When you think the dog understands her job, gradually increasing the pressure or temptations to do the wrong thing so that you can catch her quickly when she makes a mistake or reward her quickly when she continues to do the right thing, so that, for example, she knows "down" means "lie down and stay down" always, in any situation, no matter what. As in, 50 fricking attempts at a Masters Jumpers Q with only one success to show for it. As in, not a single carnfounded Grand Prix Q since spring of 2008. Really. As in, most Standard runs with a reaaaaalllly long time because our elbows are hovering over the table instead of resting on it, sometimes even going wayyyy over course time, which is inexcusable for a dog as fast as she is. We hied our hineys up the hill yesterday to have our horrible handicaps healed. Huh! I'm condensing an hour's worth of discussion and examples, but need to track it for my own sake. Today, I'll talk about the table. Tomorrow, the rest of it. If the dog isn't fast enough in the down or makes a mistake (lifts an elbow, e.g. ), get her off the table really fast (just take her collar and bring her off), be cheery and excited, and get her back on as quickly as possible (with the command); you don't have to move far from the table during this maneuver. As soon as she's good, give her a treat (preferably drop on the table between her front legs so she's going down for the treat, not lifting her head to you). Be very quick with the treat if she's having trouble and gets even a half second of success. If she fixes herself (quickly), e.g., starts to move then puts elbows back down, go ahead with reward, means she's getting it. With a handful of treats, hold them over her head. (See makes a mistake, above). Hold them behind her. Hold them in front of her. Wave them around. Hold them lower than the level of the table. Etc. Same thing with a toy. Jump and dance around the table. Throw the toy. Do exciting things with the toy and throw it. You need to be able to move a long way from the table; as soon as she's down, quickly move 10-15 feet away to proof it. If you hang out by the table and then move away, she might take that as a cue that you're about to GO! Also recommended: Teach her a chin-down command and use it regularly on the table. Do a million tables with these various proofings. "Bliss" is a comic strip that runs in the San Jose Mercury News (and many other papers). The humor appeals to me, and furthermore, he does a lot of dog cartoons. Today's elicited a rueful laugh: Been there! And hoped the neighbors weren't watching! You can see his cartoons on his web site, HarryBliss.com. (Skip the intro, click for the comics.) And ask your paper to start running it if you like it. Several weeks ago, Boost's eyes started gooping up a couple times a day. 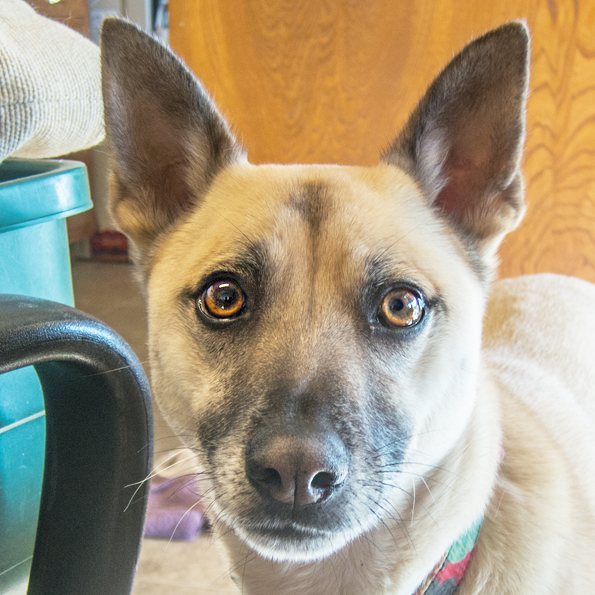 Sure, my yard is dusty, but my yard is always dusty, and Tika's eyes weren't gooping up. Vet didn't find anything obvious (well, I didn't either, but it would've had to be obvious for me to spot it). He says the odds are good that it's allergies to something, probably in the air (since nothing else has changed--bedding, house, food, etc. ), so we're treating it as such. Ointment for the eyes three times a day; benadryl (Diphenhydramine) twice a day. SUMMARY: Wednesday afternoon hike with photos. I went around to the south entrance this time, which I hadn't been to before. Drove past miles and miles of the usual suburbs, out to the end of Almaden Expressway and turned onto McKean road, and suddenly to my surprise I was out in the middle of nowhere. 20 minutes from my house, and when I got out of the car, the only sounds were the breeze, an occasional "moo," an occasional whinny, a determined rooster practicing his crowing, and an occasional jet going by overhead. I want to live there, and I want to live there NOW! Huge space to put an agility field; walking distance of some good uphill/downhill hiking with decent views; very quiet! I wonder whether I could find something like a granny house or empty garage to rent for not much money and set myself up a tiny office and work there every day? Take the dogs with me, hike morning and evening and lunch, and get in some good solid work without the usual home distractions? Well, it's a fantasy probably, but, wow, no, really, I DO want to live there RIGHT NOW! It was a short hike because I was feeling like I didn't have a lot of time that day--just 2.7 or so miles, maybe 500 feet total elevation gain. Weather remains unseasonably cool, so I barely broke a sweat. Boost drank a lot at our first drink stop, but Tika drank nothing the whole trip, and Boost wanted no more after that. I put all the photos with narrative of the trip (includes a very few flowers and views) on my photo site here. It just takes so long to upload them here, one at a time, plus I can keep all my photos in one place. So--enjoy! Noon: Walkies friend's Ice Cream Sociable starts at noon, and I have been SO looking forward to this! Homemade ice cream and a plethora of toppings! Until an hour ago, I though I was going to have to arrive late, but now with the excellent movie time it looks like it won't be much late. The better to put calories on, my dear. Sunday: Does this sound like a great hike with the Sierra Club, or what?! 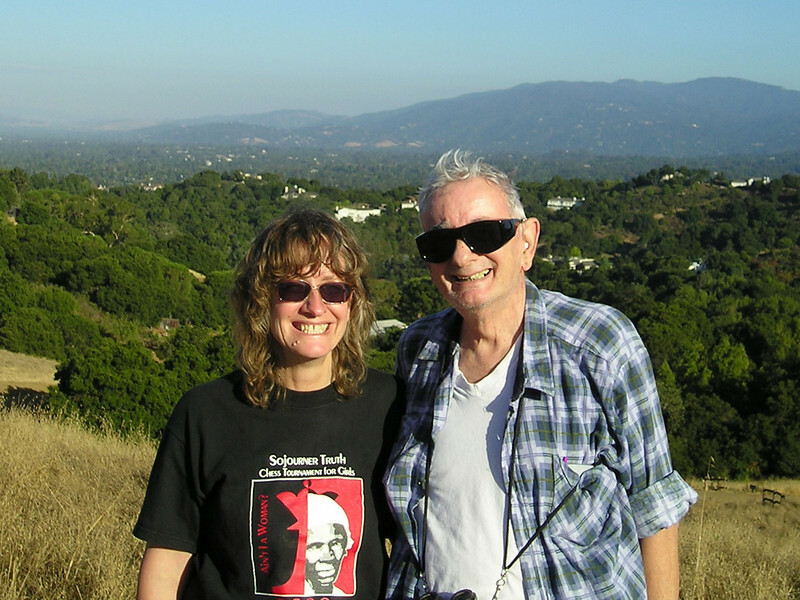 8 mile tour of Pacifica ridges that supported the Cold War, Milagra and Sweeney Ridges. There will be spectacular views as we alternate between the present and chaparral unchanged since the 18th century. We return by way of Mori Point and the edge of the Pacific Ocean. 8 miles with 1500 feet elevation gain. No-leader carpool #7 10:15 am. Event covers 8 miles, with less than 2,000 feet of elevation. Sorry, dogs staying home through ALL of this, poor Merle Girls. Took 'em this evening out to the park and threw the frisbee and let Boost practice full-speed herding of other people's dogs until their tongues tripled in length. Hope that'll hold 'em for a little while. Life is so full of wonderful things to do when I'm not sucked into agility weekends! This is what I miss when I start doing too much of that addictive dog sport. SUMMARY: I can hear you now! Saw the ear doctor Monday and the hole in my right eardrum has closed completely. For the longest time, I worried that I'd never be able to hear properly again out of that ear, but just a couple of weeks ago, I realized that improvements were happening. Now, I can't tell any difference in my hearing at all from my other ear. Whew! SUMMARY: Weekend away, Tika soreness, video camera, upcoming schedule. Last weekend I spent a weekend away with friends and family at an annual relax-a-thon, without the dogs. But I got my toenails painted with little doggie footprints. In my favorite colors. Meanwhile, Tika's soreness seems to have gone away again, thank goodness. She's been off rimadyl for a week and there's been no yelping or limping for 10 days. Took her to class this Tuesday and she ran fine in both Jumping Land and Contact Land. Whew! Another Bay Teamer read my plight about my video camera, and produced a very compact JVC camcorder that she'd almost never used and offered it to me if I like it. So far I like it! The agility community has always been extremely generous with so many things for so many people. Now I just need to take some videos--and find a not-too-expensive place to get all my tapes converted to DVDs. Judging clinic: I would SOOOO like to do it (mostly for the course building aspects, don't really want to be a judge, mostly for the course building aspects--wait, how's that again?) but it's so expensive amidst all those trials. Argh. If only someone would buy me a winning lottery ticket. SUMMARY: Snooker, Gamblers, Full House--gimme gimme gimme! Maybe it's because I can pick a course that I and my dogs can do well, maybe it's because other people are more intimidated by making their own courses, maybe it's because good handling really counts and there aren't as many people around doing your exact same course to get handling tips from--dunno, whatever, but I love doing point-accumulation courses and usually do fairly well at them. Nontraditional gambles, which are basically whatever the judge wants to invent and so can be point-earning bonanzas. Full House, which is basically a gamblers opening period with no closing or gamble required. Points points points! There's no reason in my book why Tika and Boost shouldn't be getting high points in all of these every time. Well, yeah, except for, like, knocked bars--hold that thought. Boost has more speed than Tika, so on a smooth, flowing course, I know that I can cover more yardage with her than with Tika, so can get more obstacles. Assuming everything goes well. I marked my course on the map, but you'll see that "T"ika and "B"oost have slightly different finishes. This was a nice run for both dogs: Boost had the highest score of all 85 dogs; Tika had the 2nd highest. Today, the judge decided that you had 30 seconds in which to accrue as many points as you wanted (standard gamblers opening rules), then 18 seconds in which to get at least one 5-pointer, one 3-pointer, and one 1-pointer and get to the table. The bonus: If you got those required 3 obstacles, you got a bonus of 12 points. The catches: If you don't get them, you don't qualify; if you don't get to the table before the 18 seconds are up, you ALSO don't qualify. NOTE: In CPE, they never sound the 2nd (final) buzzer, so you don't know whether you've gone over time until you see the results. Because Tika's dogwalk isn't lovely (she's either fast & likely to fly off, or slows way down to hit the end zone), I did different courses for the two of them--used some of the same components (aframe/tunnel double loop is a great way to get points; teeter/weave loop in this one also pretty good). Boost's course actually flows better from the get-go. These weren't stellar runs: Tika had 3rd highest points of all 85 dogs (might have gotten more if we hadn't had bobbles--also the one who had 2nd highest ran after us so knew what we had done and REALLY pushed the limits on their run; they missed being NQed by a fraction of a second). Boost ended up with highest points but no Q. You'll see why. Watch the left-most timer in the lower left; she hits the start line at about 6 seconds, so she needs to be on the table before it hits 54 seconds. As you can see, that "over just one jump" thing wasn't happening. She hit the 1st bar at 51 seconds. She hit the 2nd bar right at 54 seconds, so even if she'd gotten it, we weren't going to Q, and I was pretty sure we were over time. But dangit, since there was no second buzzer, I was just going to keep trying for that danged jump. And on the jump after the Aframe, and going to the tire the first time, and the 2nd and 3rd jumps at the end, you see her doing some of the "this jump?" thing (she hesitates, not driving forward, looking at me instead of for obstacles to do, or jumps in front and faces me instead of looking for obstacles--). Sigh. SUMMARY: Video from last month's CPE trial. SUMMARY: --at Team Small Dog, which I'd be remiss if I didn't mention. 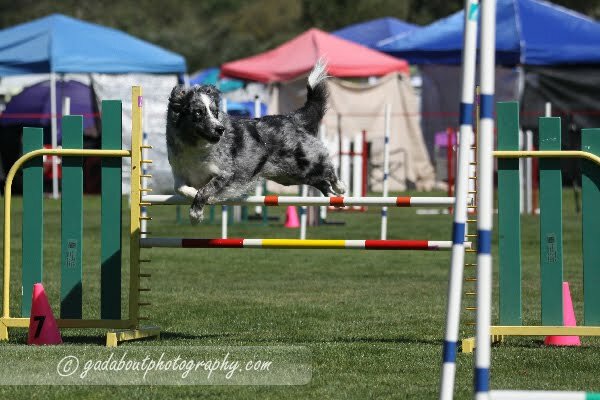 An interview in which Nancy Gyes gives us the Secrets of the Dog Agility Universe. 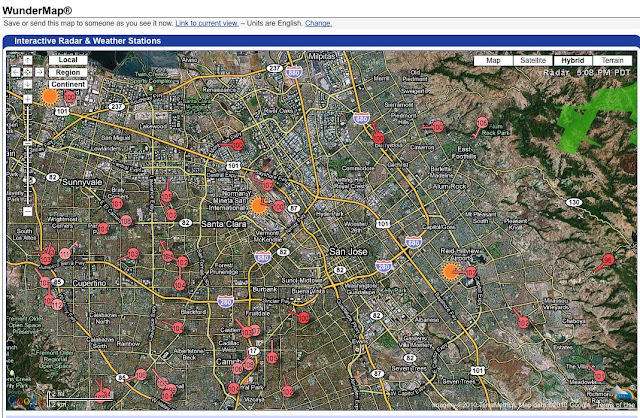 SUMMARY: Mostly current results from USDAA site. 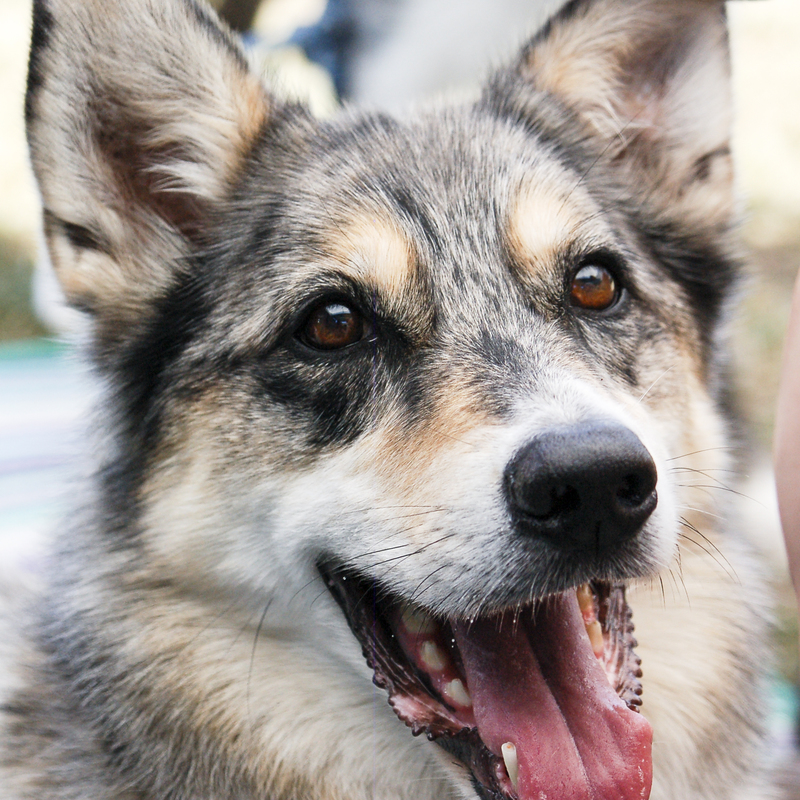 Please forgive me my indulgences: 4 agility dogs and 15 years of agility, and I've never been in this position before, so I'm absolutely thrilled (if you can't already tell) that Tika's doing so well in Top Tens. Looks like our most-recent USDAA trial is in the database now. Funny thing--all our numbers matched *before* this, but don't match now. They're close. I'll have to check Tika's records on their site sometime. SUMMARY: Tika soreness and food thief in the dark. Tika's soreness is puzzling. The first time she hit the sore spot and came up limping where I could see it, she yelped when I touched her toe. But then touching everything again got no response (except the usual "why are you touching my feet?"). She's always better in about 30-60 seconds and rarin' to go full blast again. Right at the beginning of Saturday's hike, she suddenly pulled up with her foot in the air, so I went ahead and put on her bootie. Last winter when she was sore, it was her toe, and this seemed to protect it from the extra catch or twist. This time it doesn't seem to do much, if anything at all. Most of the way through the hike, Boost got in her way once, near a stony dip in the trail, and up came the paw. A little rubbing and attention, and half a minute later she was completely fine again, no limping. I've been using the bootie on her when playing in the yard. For a couple of days, it kept her from wanting to do anything at all ("I can't walk with this thing on! "), but then she reacclimatized and now "frolics" with the usual wild, driven intensity, and is usually fine, but then, suddenly, ping!, she's limping. A little sit, a little checking for soreness, and 30 seconds later, she's fine. Meanwhile, Sunday morning I came downstairs to discover a trail of tiny muddy footprints across my back deck leading to my dogfood bin, whose lid was off. The dogs snuffed the trail and the bin with extreme prejudice, then discovered that dogfood had been scattered on the ground below the deck, and focused on retrieving that. Last night, I latched the lid down. (It's an amazingly tight seal.) Middle of the night, Tika started going nuts. I finally gave in and let the dogs out of the bedroom--Tika shrieking the whole way as they hurled themselves down the stairs (sorry, renter housemate!). Both were barking and plunging ferociously at the sliding glass door before I could get there and turn on the light. The bin had been dragged to the other side of the deck and was on its side, but the lid held. Once again, I didn't get a look at the culprit. But usually a good dose of dog barkification scares them out of coming back again. The rest of the night was peaceful.